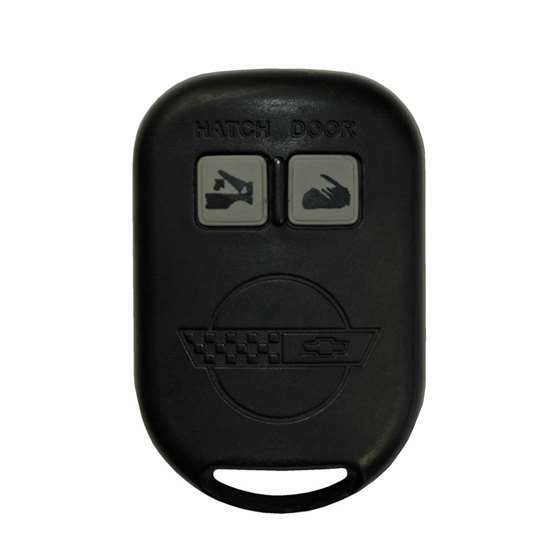 This keyless remote programming instructions work for VETTE 2 button remote with part # 88960923 FCC id PNZ0202T, ABO0202T on the back of it. 1. Keep all remotes away from the car. 4. Press the TRIP ODO button once. 5. This time, press and hold the TRIP ODO button for 5 seconds. 6. Within 5 seconds press and hold the FUEL INFO button for 10 seconds. The passive keyless entry telltale lamp should turn on continuously. 7. Turn the key in the ignition to LOCK. The passive telltale lamp should flash. 8. The lamp will flash the number of the remote to be programmed (a maximum of 3). It will flash once for the first remote, twice for the second, and three times for the third. NOTE: When a remote is within range a code is stored, the lamp will be illuminated continuously as long as the remote remains within reception range. When a remote that has been programmed already is brought back into range the lamp will flash until a new remote is brought into range. Once the 3 remotes have been programmed and the third remote is out of range the lamp will not illuminate. It is important to move a programmed remote out of range before programming the next one. 9. To turn the programming mode off just simply remove the key from the ignition. Thanks for sharing the tips of resetting the remote keys of the car. Get the replacement of the keyless entry car from experienced store such as replacemyremote at a reasonable price.